Create a bold message with changeable letters. This additional 8" letter kit comes with Black letters, red numbers and symbols. 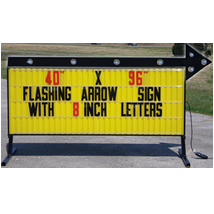 The 8" letter are printed on 9" plastic panels which fits standard letter track on sidewalk and roadside signs.